In its early years Strathmore’s students were organised into houses for sporting competitions. Four houses, four colours – Brown, Gold, Green and Red. From 1957 to 1962 this was the basis for Athletics, Swimming, Cross Country, Hockey, Softball and Basketball competitions. In June of 1962 the school decided to make a change to the arrangement with the four houses being given names as this short article from the Glamis Gazette of June 1962 explains. In 1963 we see Ross winning the Swimming house sports. 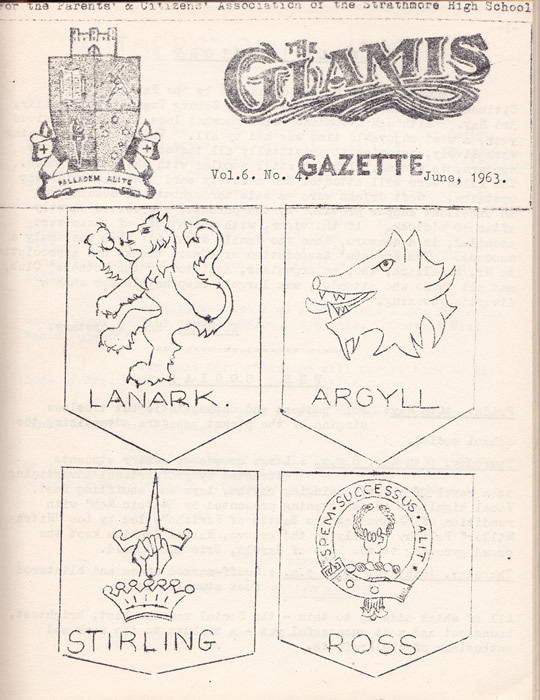 Adding to the names, the Glamis Gazette of June 1963 shows us the crest adopted by each of the four houses. The houses remained the basis for sporting competitions into the 1970’s but by the end of that decade had largely disappeared from the organisation of school activities. A decade later houses, or student teams, would be reintroduced into the school but in a very different form.